SPRING SPORTS 2017: PAGE 11 PRESS & DAKOTAN ? PLAIN TALK S.D. 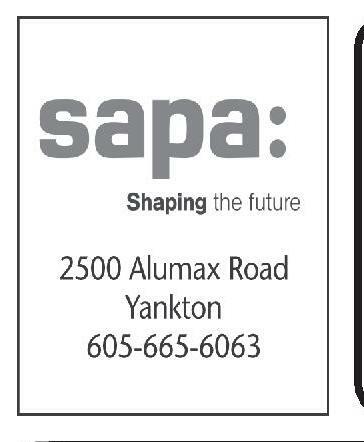 Boys Kortan Set For One More Busy Spring FROM PAGE 10 BY MICHAEL HAMMOND sports@yankton.net Jack Walters (8th), Malachi Brouwer (7th), Owen Hunter (7th), Blake Meyer (7th), Chris Wirth (7th). For the sixth-straight spring Chase Kortan will be a busy athlete as he finishes out his final seasons of track and baseball. Kortan, a Tabor native who attends Bon Homme high school, has been playing varsity baseball and ran varsity track since the seventh grade and has excelled at both—not to mention his exploits on the football field and basketball court. Bon Homme’s four-sport star will finish out his senior seasons for track and baseball this spring before heading to South Dakota State in the fall to play baseball. “I’m just trying to enjoy every track meet and every practice,” Kortan said. “I want to soak it all in because it’s the last time I will be doing it.” Practice? Yes practice, a thing Kortan hasn’t missed his entire career according to his track and football coach Byron Pudwill. “I’m a big fan of Chase,” Pudwill said. “The thing I will miss most and remember about Chase is that he never misses practice.” A normal day for Kortan in the spring starts with going to school, then straight to track practice, followed immediately by baseball practice with his night ending around 8 p.m. All of those practices have led to plenty of time to work on his crafts and the results have been astonishing. Kortan has 15 medals state track medals to his name, including the 2016 long jump championship in Class A, and lead nearly every career statistical category for Bon Homme’s baseball team since his father, Gary Kortan, took over as coach in 2004. “Juggling two sports is difficult, but he manages it and excels in both of them,” Gary said. “Through 14 years of kids, he leads us in every offensive and pitching category besides walks.” With all of the success in the past, Chase still has his sights set high as his main goal for the spring is repeating as long jump state champion. “I’ve had confidence throughout the years and it has turned out well,” Chase said. “I would like to repeat in the long jump and finish higher in the 100- and 200-meter dashes.” A repeat in long jump, higher sprint finishes, and a berth in the high school baseball state tournament would give Chase a senior spring he won’t forget. “For sure at the top of his list of goals is to repeat at state in long jump,” Gary said. “As his baseball coach, I’d like to see him lead us to the state high school tournament.” Bon Homme/Scotland will have a good chance of reaching the state tournament this spring as they bring back their entire pitching staff from last year’s team who fell in the region championship game 2-1 to Dakota Valley. As a junior Chase hit .400 with 14 RBI and was 3-0 on the mound with 63 strike- Dakota Valley COACH: Vince Tucker ASSISTANTS: Tammy Lilly, Ben Blaeser, James Schmidt VITALS: Class A, Region 4, Dakota XII Conference LAST YEAR: The Dakota Valley boys placed seventh out of 12 teams at their conference meet last year. RETURNERS: John Green (Jr., distance), Noah Keime (Jr., discus), Tyler Kennedy (Jr., distance), Kaleb Martin (Jr., pole Vault), Travil Ohl (Jr., long jump), Bryce Schroeder (Sr., sprints), Cole Schultz (So., sprints), Eli Gaini (So., sprints), Hayden Jensen (So., distance), Henry Jensen (So., distance), Darrick Sexton (Jr., throws), Christian Weinandt (Jr., pole vault), Trystan Michels (So., distance), Mitchell Kirsten (Jr.), Jared Messersmith (Jr., distance), Josh Midland (Jr., distance) NEWCOMERS: Cole Bergmann (Jr., jumps), Sam Chesterman (So., sprints), Cameron Fisher (Sr., sprints), Todd Green (Fr., sprints), Jacob Kenny (Jr., throws), Brennen Morgan (Jr., throws), Ryan Parker (Sr., throws), Sam Wente (Jr., throws), Joe Graves (Fr., distance), Rafael Marquez (So., throws) Elk Point-Jefferson COACH: Danny Hutcheson ASSISTANTS: Justin Clercx, Haley Homan VITALS: Class A, Region 4, Dakota XII Conference LAST YEAR: Last season EPJ qualified two relays and five individual events for state. RETURNERS: Dylan Colt (Sr., medley relay, 800 meter, 3200 meter relay state qualifier), Zeke Robinson (medley relay, 100 meter, 200 meter state qualifier), Preston Fejfar (Jr.) NEWCOMERS: Bradley Hines (So. ), Aaron Koupal (Sr.), Jack Grassel (Sr.), Logan Donelan (Jr.), Alex Wu (Sr.), Ethan Hammitt (Fr. ), Demetis Nuno (Fr.) Freeman COACH: Rory Hermsen ASSISTANTS: Curt Sage, Chris Maske, Jordan Pater VITALS: Class B, Region 5, Cornbelt Conference LAST YEAR: The Flyers finished sixth at the region meet. RETURNERS: Jalen Kantman (Sr.); Dalton Bodewitz (Jr.); Jett Dubs; Charles Herberts (Jr.); Austin Hofer (Jr.); James Baer (So. ); Shay Saarie (So. ); Braxton Schmidt (So. ); Skyler Godwin (So.) Freeman AcademyMarion COACHES: Jerry Kippes, Suzanne Koerner ASSISTANTS: Dan Haggerty, Will Massey VITALS: Class B, Region 5, Tri-Valley Conference LAST YEAR: This will be the first season that Freeman Academy and Marion will be together for track and field. RETURNERS: Jesse Blazer (Sr.), Derian Voigt (Sr.), Ernest Johnson (Sr.), Brennan Haggerty (Jr.), Stephen Waltner (Jr.), Luke Allison (Jr.), Preston Engbrecht (So. ), Thaniel Schroder (So., 5th place state 1600m run, 3rd place state 3200 meter run), Danny Cremer (Fr. ), Jamison Lundy (Fr. ), Kayden McCoy (Fr. ), Beau Miller (Fr. ), Junior Montero (Fr. ), Todd Obele (Fr. ), Gavin Pankratz (Fr. 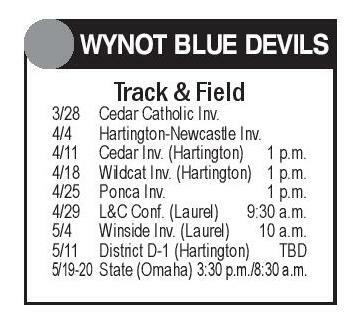 ), Payton WYNOT BLUE DEVILS 3/28 4/4 4/11 4/18 4/25 4/29 5/4 5/11 5/19-20 Track & Field Cedar Catholic Inv. Hartington-Newcastle Inv. Cedar Inv. (Hartington) 1 p.m. Wildcat Inv. (Hartington) 1 p.m. Ponca Inv. 1 p.m. L&C Conf. (Laurel) 9:30 a.m. Winside Inv. 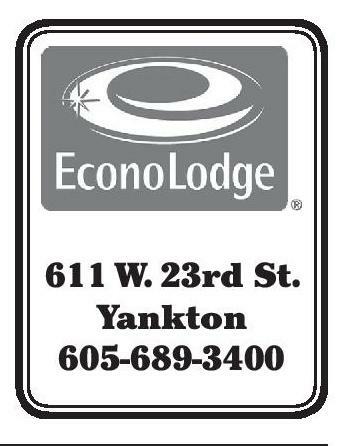 (Laurel) 10 a.m. District D-1 (Hartington) TBD State (Omaha) 3:30 p.m./8:30 a.m. Irene-Wakonda’s Cody Oien Arbach (8th), Gavin Haggerty (8th), Chris Johansen (8th), Lawton Langerock (8th), Logan Langerock (8th), Jayden lemons (8th), Gabe Miller (8th), Titus Roesler (8th) Gayville-Volin COACH: Larry Buffington ASSISTANTS: Jeremiah Dibey, Tom Rice, Bobbie Moehring, Gene Bormann VITALS: Class B, Region 5, Tri-Valley Conference, Great Plains Conference RETURNERS: Grant Rice (Sr., throw and sprints); Chase Petrik (Sr., pole vault, triple jump and hurdles); Brook Van Osdel (Sr., discus); Taven McKee (Jr., sprints); Cade Rickford (Jr., sprints); Trey Ulmer (So., pole vault, triple jump, sprints). Skyler Olson (So., high jump, hurdles, sprints) NEWCOMERS: Jama Sedique Amir (Jr., sprints); Janin Moonmin (Jr., mid distance) Irene-Wakonda COACH: Brent Mutchelknaus ASSISTANTS: Bridget Healy, Mike King, Landra Knoel, Clara Schild VITALS: Class B, Region 5, Tri-Valley Conference LAST YEAR: The Eagles graduated three seniors. RETURNERS: Bradley Emmick (Sr.); Anthony Nelson (Sr. , state qualifier 110 and 300 hurdles, 4x400); Levi Van Beek (Sr., state qualifier 4x100, 4x200, 4x400); Alfonso Erickson (Jr.); Tate Gale (Jr.); Dallas Lee (Jr., state qualifier4x100, 4x200, 4x400); Garrett Logue (Jr.); Cody Oien (Jr., state qualifier-pole vault); Brett Olson (Jr.); Mike Sees (Jr.); Brendan Sokolowski (Jr., state qualifier- pole vault); Trey King (So., state meet-long jump 6th, qualifier-triple jump, 4x100, 4x); Brannon McDonald (So. ); Tale Nielsen (So. ); Parker Orr (So. ); Ben Sees (So. ); Joe Sees (So.) NEWCOMERS: Evan Logue (Fr. ); Cal Lucas (Fr. ); Convin Spurrell (Fr. ); Tate Van Beek (Fr.) 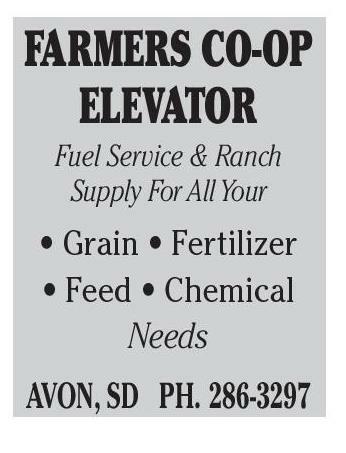 Boys’ Golf • Grain • Fertilizer • Feed • Chemical Needs AVON, SD PH. 286-3297 Platte-Geddes COACH: Matt Maxon ASSISTANTS: Darren DeNeui, Christa Peterson VITALS: Class B, Region 6 ROSTER: Jarod Severson (Sr.), Bryan Pope (Sr.), Malchi Girton (Sr.), Peyton Nelson (Jr.), Riley Stegmeier (Jr.), Blake Bultsma (Jr.), Beau Dean (So. ), Hayden StLuka (So. ), Caden Tegethoff (Fr. ), Kade Starr (Fr. ), Aaron Gerlach (Fr. ), Ali DeNeui (Fr. ), Matthew Brink (Fr.) Chase Kortan follows through on a swing during the club high school baseball season. He will play baseball at South Dakota State next season. outs and a 0.70 ERA. His efforts earned him a spot on the 1st Team All-State list. Even with numbers like his, it can be hard to be noticed by college for baseball in South Dakota. Chase attended various scouting camps and caught the attention of some scouts. One camp was the Hank Krause Miami Marlins camp held in Yankton last summer, where he was among three standout players. Word eventually reached SDSU and Chase decided to continue his baseball career for the Jackrabbits in Brookings. “Baseball was my first love in sports,” Chase said. “I’ve been playing since I was five, so that’s what I decided to do and it should be fun.” Chase also fielded offers from other schools for football and track before deciding on SDSU. “He could have gone Division I in football and track probably also, but baseball was his first love and that’s what he chose,” Gary said. “He would play all day if he could.” Along with his final goals for his high school career, Chase also has big plans for when he reaches Brookings. “I would like to start as a freshman and get time right away, but that is going to take a lot more work,” Chase said. Pudwill offered Chase another his own theory before he committed to SDSU. “I told him, ‘you can go to college and run down the runway and jump three times and you’re done,’ just joking around with him, but I think he made the right choice,” Pudwill said. “He loves baseball.” That opportunity may present itself in the future, but for now Chase will be focusing on his senior spring and working towards his baseball future. Follow @michaelhammond_ on Twitter. Scotland Menno Tripp-DelmontArmour COACH: Ron Weber ASSISTANTS: Aimee Lenocker, Lee Irvine VITALS: Class B, Region 6, Little Missouri Valley Conference, Great Plains Conference RETURNERS: Daniel Fuoss (Jr.); Cade Gemar (So. ); Jacob Kriz (So. ); Connor Van DerWerff (So. ); Cooper Strand (Sr.); Micah Lau (Fr. ); James Love (So. ); Alex Veik (Jr.); Tristin Bialas (Fr. 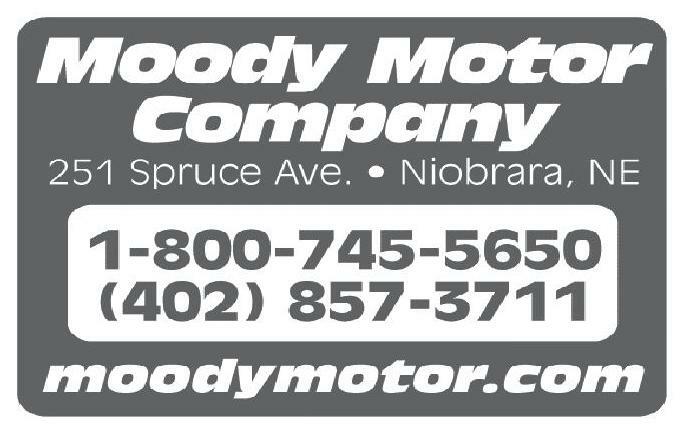 ); Jason Schnabal (Jr.) Viborg-Hurley COACH: Bill Hansen ASSISTANTS: John Nyhaug, Tyler Novak, Robbie Kessler VITALS: Class B, Region 5, Tri-Valley Conference RETURNERS: Logan Slack (Sr., state qualifier in 3200 relay and 3200-meter run), Walker Kropuenske (Sr., state qualifier 3200 relay), Logan Hansen (Sr., state champion in the 400, runner-up in the 800, state qualifier in 1600 relay and 3200 relay), Dylan Christiansen (Sr.), Austin Johnson (Sr.), Ryan Doorn (Jr.); Shumani Westrom (Jr.), Brodee Sherman (So. ), Levi Buseman (So. ), Nathan Jahnig (So. ); NEWCOMERS: Cody Overgard (Sr.); Kasey Fox (Sr.); Brady Patterson (Sr.); Quinn Doorn (Jr.); Jacob Voss (Jr.); Nick Gaertner (Jr.); Trace Sikkink (Jr.); Tate White (So. ); Ben Jahnig (So. ); Gaerrett Knock (So. ); Connor Paetow (So. ); Devon Moen (So. ); Madison Hansen (So. ); Chase Gust (So. ); Hunter Ericksen (Fr. ); Cole Overgard (Fr. ); Ethan Engen (Fr. ); Shane Anderson (Fr. ); Pete Jensen (Fr. ); Anthony Misch (7th); Calvin Rasmussen (8th); Jacob Knutson (8th); Ty VanHull (8th); Angel Sayee (8th); James Neal (8th); Collin Graves (8th); Eli Boomgarden (8th); Grant Mikkelsen (8th); Gentry Wetering (8th); Tate Kessler (8th); Carter Gust (8th); Gradee Sherman (8th); Connor Kessler (8th); Ayden Spielman (7th); Klayton Paetow (7th); Byron Osterloo (7th); Colin McCarthy (7th); Mateus Kessler (7th) Wagner COACH: Joe Kafka ASSISTANTS: Jason Knebel, Matt Slaba, Jenny Zephier, Chad Peters VITALS: Class A, Region 5, Southeast South Dakota Conference, Little Missouri Valley Conference RETURNERS: Bryce Zephier (Sr.); Zyan Zephier (Sr.); Keegan Alderink (Jr.); Julien Weddell (So. ); Emilio Cournoyer (So. ); Lance Soukup (Fr. ); KJ St. Pierre (Fr. ); Simon Freier (8th); Malcom Janis (8th); Bradyn Lhotak (8th); Jaden Peters (8th) NEWCOMERS: Matthew Bryant (Sr.); Tysin Srpan (So. ); Stephon St. Pierre (So. ); Sagon Ulrich (So. ); Grant Namminga (Fr. ); Lukas Otte (Fr. ); Tony Bruguier (Fr. ); Steven Zephier (Fr. 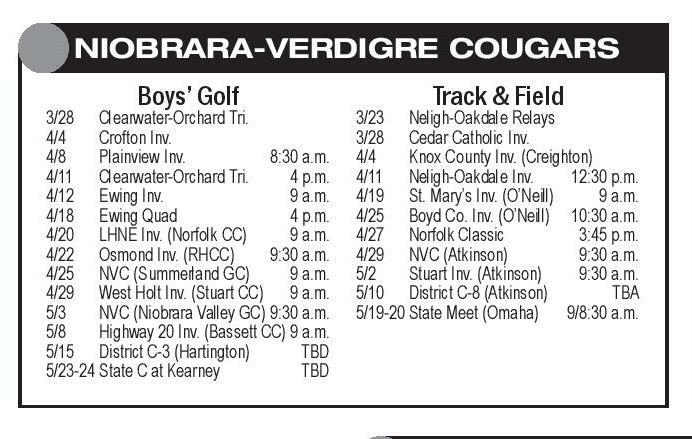 ); Preston Nedved NIOBRARA-VERDIGRE COUGARS Boys’ Golf 3/28 Clearwater-Orchard Tri. 4/4 Crofton Inv. 4/8 Plainview Inv. 8:30 a.m. 4/11 Clearwater-Orchard Tri. 4 p.m. 4/12 Ewing Inv. 9 a.m. 4/18 Ewing Quad 4 p.m. 4/20 LHNE Inv. (Norfolk CC) 9 a.m. 4/22 Osmond Inv. (RHCC) 9:30 a.m. 4/25 NVC (Summerland GC) 9 a.m. 4/29 West Holt Inv. 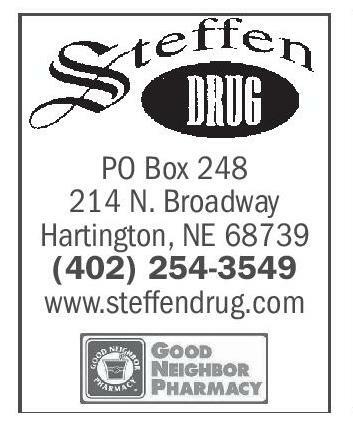 (Stuart CC) 9 a.m. 5/3 NVC (Niobrara Valley GC) 9:30 a.m. 5/8 Highway 20 Inv. (Bassett CC) 9 a.m. 5/15 District C-3 (Hartington) TBD 5/23-24 State C at Kearney TBD Track & Field 3/28 Cedar Catholic Inv. (Hartington) 4/4 Hartington-Newcastle Inv. 4/11 Cedar Catholic Inv. 1 p.m. 4/18 Wildcat Inv. (Hartington) 1 p.m. 4/22 Wausa Inv. (Pierce) 9:30 a.m. 4/27 Norfolk Classic 3:45 p.m. 4/29 L&C Conf. (Laurel) 9:30 a.m. 5/4 Norfolk Catholic Inv. 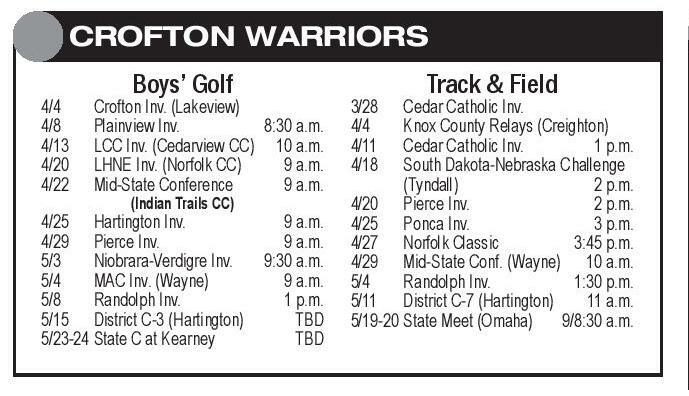 2 p.m. 5/11 District C-7 (Hartington) 11 a.m. 5/19-20 State Meet (Omaha) 9/8:30 a.m. Track & Field 3/23 Neligh-Oakdale Relays 3/28 Cedar Catholic Inv. 4/4 Knox County Inv. 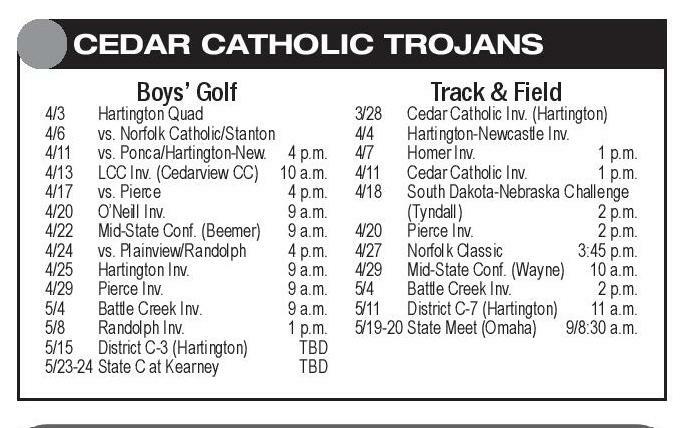 (Creighton) 4/11 Neligh-Oakdale Inv. 12:30 p.m. 4/19 St. Mary’s Inv. (O’Neill) 9 a.m. 4/25 Boyd Co. Inv. (O’Neill) 10:30 a.m. 4/27 Norfolk Classic 3:45 p.m. 4/29 NVC (Atkinson) 9:30 a.m. 5/2 Stuart Inv. (Atkinson) 9:30 a.m. 5/10 District C-8 (Atkinson) TBA 5/19-20 State Meet (Omaha) 9/8:30 a.m. 2410 Broadway Ave., Yankton, SD 57078 (605) 665-8717 CROFTON WARRIORS 4/4 4/8 4/13 4/20 4/22 Boys’ Golf Crofton Inv. (Lakeview) Plainview Inv. 8:30 a.m. LCC Inv. (Cedarview CC) 10 a.m. LHNE Inv. (Norfolk CC) 9 a.m. Mid-State Conference 9 a.m. (Indian Trails CC) 4/25 Hartington Inv. 4/29 Pierce Inv. 5/3 Niobrara-Verdigre Inv. 5/4 MAC Inv. (Wayne) 5/8 Randolph Inv. 5/15 District C-3 (Hartington) 5/23-24 State C at Kearney 9 a.m. 9 a.m. 9:30 a.m. 9 a.m. 1 p.m. TBD TBD 3/28 4/4 4/11 4/18 Track & Field Cedar Catholic Inv. Knox County Relays (Creighton) Cedar Catholic Inv. 1 p.m. South Dakota-Nebraska Challenge (Tyndall) 2 p.m. 4/20 Pierce Inv. 2 p.m. 4/25 Ponca Inv. 3 p.m. 4/27 Norfolk Classic 3:45 p.m. 4/29 Mid-State Conf. (Wayne) 10 a.m. 5/4 Randolph Inv. 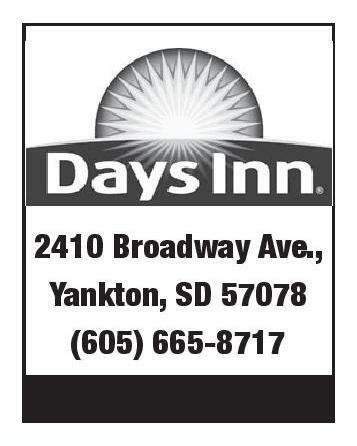 1:30 p.m. 5/11 District C-7 (Hartington) 11 a.m. 5/19-20 State Meet (Omaha) 9/8:30 a.m. 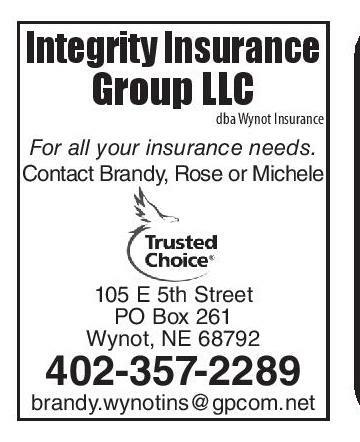 Integrity Insurance Group LLC Insurance dba Wynot FARMERS CO-OP ELEVATOR Fuel Service & Ranch Supply For All Your Parker COACH: Phil Bjorneberg ASSISTANTS: Derrek Sattler, Jill Christensen, John Silvernail VITALS: Class B, Region 5, Big East Conference LAST YEAR: The Pheasants finished sixth at state, but gone is three-event champion Zack Anderson (now at USD). RETURNERS: Shane Kasten (Sr., sprints); Landon Leberman (Sr., 100m-800m); Jayden Even (Sr., sprints); Grant Plucker (Jr., placed at state wrestling this year, good 400m runner); Blake Olson (So., 100m-800m); Joe Joffer (So., going to be a very good thrower); Tanner Even (Fr., 400m-800m); Mace Plucker (Fr., 400-800m); Jake Hazen (Fr, sprints); Jace Bridges (Fr., shotput, discus) NEWCOMERS: Mayson Preheim (Fr. ); Grace Koch (Fr. ); Evan Dubbelde (Jr.); Blake Eldeen (Fr. ); Macy Kippes (7th); Alexis Even (7th) COACH: Gary Pepper ASSISTANTS: Chris McGregor, Calvin Hunhoff VITALS: Class B, Region 5, Southeast South Dakota Conference, Little Missouri Valley Conference, Great Plains Conference LAST YEAR: Scotland lost one senior (Tanner Iwan) to graduation. 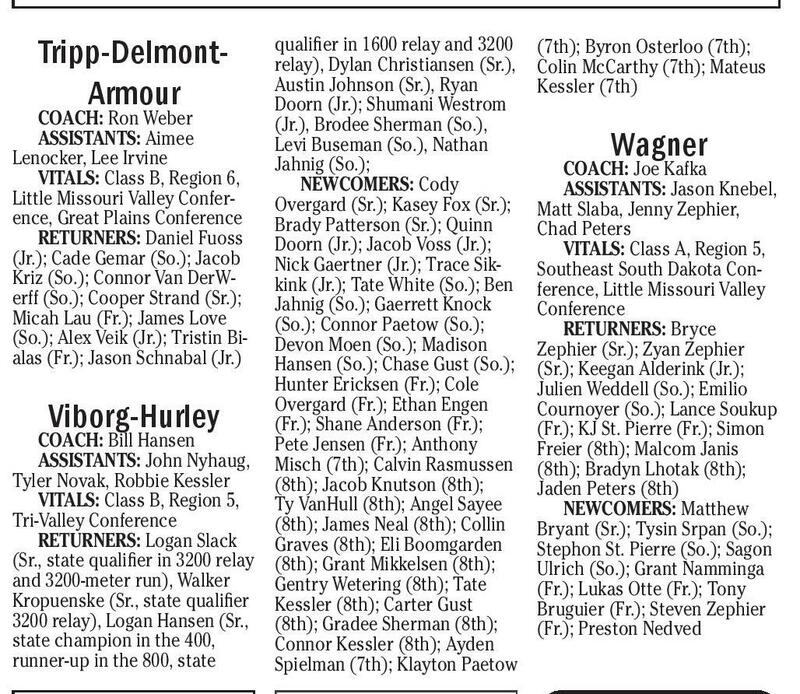 RETURNERS: Tanner SkoreCOACH: Ken Bruckner pa (Sr., state placer, shot put), ASSISTANTS: Cindee Even- Chandler Diede (Sr.), Chase son, Ryan Liebl, Alex Warnke, Mogck (Sr.), James Baker (Jr.), Kari Zeeb Derek Pedersen (Jr.), Garret VITALS: Class B, Region 5, Vitek (Jr.) Cornbelt Conference NEWCOMERS: Luca LAST YEAR: The Wolves D’Amato (Sr.), Anthony Radreturn three athletes who com- cliffe (Sr.), Michael Lange (Jr.), peted at the state meet. Braden Wolfe (Jr.), Nic Baker RETURNERS: Trey Bohlman (So. ), Dallas Fuerst (So. ), Dane (So., throws, sprints, discus James (So. ), Lucas Pederstate qualifier), Logan Klaudt sen (So. ), Micah DeBoer (Fr. ), (So., middle distance), Dylan Mason Dennis (Fr. ), Ty Mogck Lammers (So., long jump, triple (Fr. ), Carson Sundleaf (Fr. ), jump, sprints), Kyle Munkvold Jordan Gall (8th), Daniel Lange (high jump, middle distance, (8th), Dawson Bietz (7th), sprints), Joe Grassmid (Fr,. Nicholas Harrington (7th) distance), Avery Handel (Fr. ), Grant Handel (Fr. ), Dawson Ulmer (Fr. ), Levi Bander (8th), Brady Fergen (Fr. 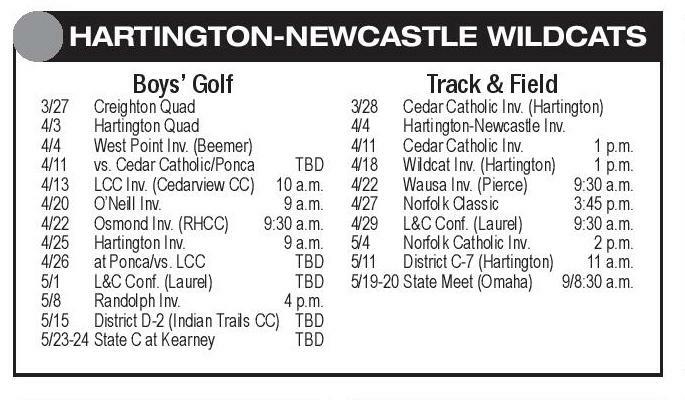 ), Caden HARTINGTON-NEWCASTLE WILDCATS 3/27 Creighton Quad 4/3 Hartington Quad 4/4 West Point Inv. (Beemer) 4/11 vs. Cedar Catholic/Ponca TBD 4/13 LCC Inv. (Cedarview CC) 10 a.m. 4/20 O’Neill Inv. 9 a.m. 4/22 Osmond Inv. (RHCC) 9:30 a.m. 4/25 Hartington Inv. 9 a.m. 4/26 at Ponca/vs. LCC TBD 5/1 L&C Conf. (Laurel) TBD 5/8 Randolph Inv. 4 p.m. 5/15 District D-2 (Indian Trails CC) TBD 5/23-24 State C at Kearney TBD Fischer (8th), Weston Freier (8th), Logan Schmidt (8th), Levi Bender (8th) NEWCOMERS: Jordan Mehlhof (Sr.), Aiden Friesen (8th), Tyler Massey (7th), Trayton Slayer (7th) PO Box 248 214 N. Broadway Hartington, NE 68739 (402) 254-3549 www.steffendrug.com For all your insurance needs. 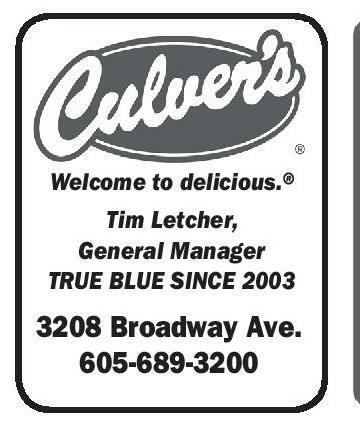 Contact Brandy, Rose or Michele 105 E 5th Street PO Box 261 Wynot, NE 68792 402-357-2289 brandy.wynotins@gpcom.net Welcome to delicious.® Tim Letcher, General Manager TRUE BLUE SINCE 2003 3208 Broadway Ave. 605-689-3200 611 W. 23rd St. Yankton 605-689-3400 CEDAR CATHOLIC TROJANS Boys’ Golf 4/3 Hartington Quad 4/6 vs. Norfolk Catholic/Stanton 4/11 vs. Ponca/Hartington-New. 4 p.m. 4/13 LCC Inv. (Cedarview CC) 10 a.m. 4/17 vs. Pierce 4 p.m. 4/20 O’Neill Inv. 9 a.m. 4/22 Mid-State Conf. (Beemer) 9 a.m. 4/24 vs. Plainview/Randolph 4 p.m. 4/25 Hartington Inv. 9 a.m. 4/29 Pierce Inv. 9 a.m. 5/4 Battle Creek Inv. 9 a.m. 5/8 Randolph Inv. 1 p.m. 5/15 District C-3 (Hartington) TBD 5/23-24 State C at Kearney TBD 3/28 4/4 4/7 4/11 4/18 Track & Field Cedar Catholic Inv. (Hartington) Hartington-Newcastle Inv. Homer Inv. 1 p.m. Cedar Catholic Inv. 1 p.m. South Dakota-Nebraska Challenge (Tyndall) 2 p.m. 4/20 Pierce Inv. 2 p.m. 4/27 Norfolk Classic 3:45 p.m. 4/29 Mid-State Conf. (Wayne) 10 a.m. 5/4 Battle Creek Inv. 2 p.m. 5/11 District C-7 (Hartington) 11 a.m. 5/19-20 State Meet (Omaha) 9/8:30 a.m.